Situation: You have a document with several tables. The tables have different borders or another border style than desired. You want all the tables to have uniform borders. You may have experienced that this can be rather time-consuming if you have to correct the tables one by one. Here you will find a macro that corrects the table borders of all table cells in all tables in one operation. 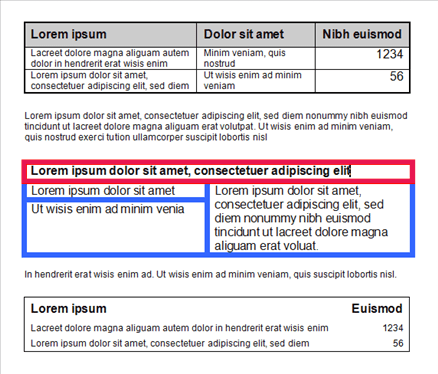 In the ApplyUniformBordersToAllTables macro, adjust the border width, style and color to fit your needs. 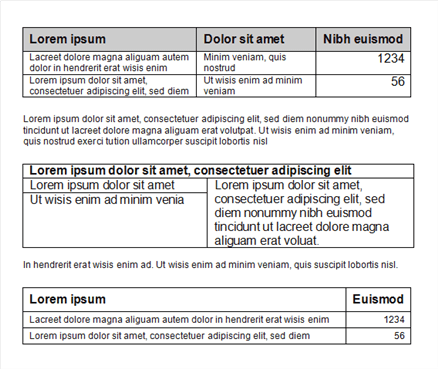 The examples below show how diffent tables will appear after executing the macro with the predefined border settings. Note that the third table contained table cells with no borders. The macro applies borders to such cells too.